This weekend Terry, Steph and I took a trip to London. This stems from when Terry had an influx of Sloth love around the time of his birthday. So Steph arranged for us to all go down to London Zoo so we could meet the sloth which lives there. Terry and I were in charge of booking the hotel (which we finalised three days before we left, whoops!). First things first, I’m a realist the hotel was great. We went for a really budget hotel for the night, we hadn’t planned well enough to stay at a half decent establishment. That said, I really felt like The Leigh House Hotel was the ultimate budget hotel we could have found. For £99 for the night, we were a short walk away from Euston, the hotel was clean and had warm running water. It was a big contrast to when we stayed at The County Inn a few years back and there was no complimentary toiletries, a freezing shower, holes in the bedroom walls and pebble dash in the toilets. Man that place was gross. I’ve written a full review of The Leigh House Hotel , which if you’re interested you can find here. Anyway, back to London. We got into town nice and early and after settling our stuff down in the hotel we started to walk towards the zoo. Y’know, after we had breakfast and some dodgy geezer from eVap tried to charge Terry £28 for a bit of eCig vapour. Avoid that place! The zoo was far bigger than I had imagined. It was epic really, we started by taking a trip into the rainforest section. What really surprised me was how interactive the zoo was. The monkeys in the rainforest area had tree branches which go over the guests heads and you can literally find yourself face to face with a little monkey guy. Of course there are staff there to keep you safe and make sure you don’t try and grab a monkey. I’m honestly surprised that is even a thing. The sloth was in the rainforest too, and Terry spent most of his time staring her down, she was asleep at this point. We then went looking for the penguins, but on the way we saw this beast of an Iguana and found ourselves by the otters. 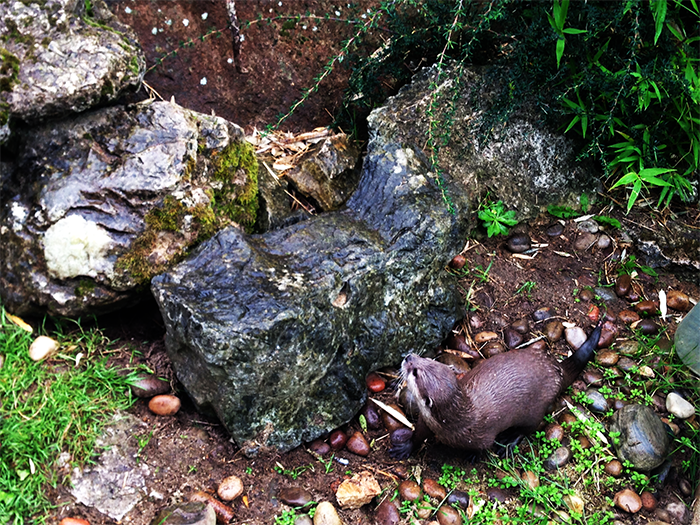 The otters were really cute, and we managed to catch them at feeding time so it was super active. we then sauntered over to the meerkats, we took so many pictures of those guys I think they count for almost a third of the gallery below. There was this one little guy who stood on a tree stump posing for the cameras for ages; he loved it. Across from the meerkats was the lemurs. I didn’t get many great pictures of them but I was excited to see them. Finally, we then found the penguins. These guys got really close as well and had their share of posers so we got some great pictures. There was an option to meet the penguins available but we didn’t take it up. Check how close we got though, did we really need it? After the penguins we saw the pelicans, tropical birds and the farm area which was full of alpacas and donkeys. We saw the camels, komodo dragons, A BIG ASSED TORTOISE. Like, it was HUGE. We saw the hippos, okapi, warthog and then we got onto the really surprising creatures. I wasn’t expecting to see African Hunting Dogs or Giraffes at London Zoo (shows how much I know about the place). But I was really psyched to see both animals. After hours of walking and excitement we decided to visit the rainforest again to see if Mrs. Sloth had woke up. She was still sedentary as ever, but her baby was awake and gave us some cute cuddle footage as she woke her mother up for a few minutes. Oh, speaking of lazy, there were lions and tigers too but as with any zoo these guys were asleep the entire time. To get back to the hotel we decided to walk. We bought a crate of Corona and planned to pass by Nandos for some tea and beers in the hotel. Well, the beers barely made it back to the hotel. We had drank six of the twelve beers in London, oh the looks we got. We’re not the best at caring especially when we’re on holiday/Day release whatever you’d call this happening. We did get Nandos. It was awesome. We went out that night in Camden, I unfortunately don’t remember the names of any of the bars we went to, one place did awesome Mojito cocktails and we… Somehow… Ended up with a random cocktail extra. It was loaded with tequila though, so it wasn’t very nice. We finished up in a bar that did two cocktails for £9.50 – which we considered great considering we had been paying £5 most of the night for a pint of lager. We had the most ferocious Long Island Iced Teas you can imagine. We got back to the hotel majorly drunk. The next morning we walked. Holy crap did we walk. We walked from the hotel at Euston all the way into Westminster. By this point we had all decided to buy iPads on contract, because I wanted one and it seemed logical that we all take the bullet and make ourselves that little bit poorer. We walked for miles up to an O2 Store in Westminster, which was shut. That was tragic. We then went to the nearest tube stop. Which was shut. We then got a taxi to the nearest open tube so we could get to the O2 Store on Bond Street. The Tube station was closed down. By this point I was thinking divine intervention did not want me to buy an iPad. We then found ourselves heading towards the next nearest O2 Store when we got off the tube. It was on Oxford Street. Steph for her iPad from the EE Store, but when Terry and I got to the O2 Store there was none available. So yeah the iPad thing never worked out. By this point we were exhausted and hungry. We found this great little 24 Hour cafe/restaurant/bar called Vinght Quatre – 24VQ. It was well priced, with a set menu option for even cheaper. The food was great, I had a chilli dog, Steph had a humous/falafel board and Terry had Chilli Con Carne. It was really nice, and we stayed in there until it was time to get the train home. Aside from being in pain from carrying bags all day, the train home was uninteresting; oh, I finally beat the Zombie mode on Plague Inc. So that counts for something. We had a great time in London, one of my best visits I’d probably say. By the time we had gotten home though we were definitely ready to sink into our own beds. Below is our combined gallery from London Zoo. Have a browse!